Note: All of the drinks in this post were sub-par. We are posting them as a recounting of what not to do. Please do not make them, they are not that great. We had some successes with our Low-Proof Thai Cocktail Week, but we also had plenty of drinks that didn’t make the cut. Two of them we already posted, the Miracle Mango Sour and the Lemongrass Soju MarTHAIni. They were OK, but they did not make the final cut. The lemongrass marTHAIni was too one dimensional — its only real flavor was lemongrass, which tastes kind of like a truncated lemon. Point of fact, it tasted kind of like a yellow fruit loop. Gross. The Miracle Mango Sour was a bit more interesting, but it lacked impact. Even with fresh citrus juice, there was simply no kick, no bite, no bracing quality to it. Part of the problem is that soju is not high-proof enough to fully extract the soft flavor of a fruit like mango. As a result, the mango flavor in our infusion was week. Hence the maxim: give soju infusions double the time and they’ll taste twice as fine. But some flavors just aren’t going to come out, no matter how long you leave them. If you drank mango-soju straight, over ice, and with a twist of lime, it would be pretty tasty, but in a mixed drink it just can’t stand up. Still, we were determined to somehow make the concept of the miracle mango sour work, so in a frenzy of mixing last friday night, we made four more iterations of it, and none of them were good enough of for the final menu. At least they look pretty. Shake over ice and double-strain into a cocktail glass. Garnish with mango cubes and a lime twist. This tasted good but it was watery. Mango-infused soju and nigori sake are both low proof and lightly flavored. 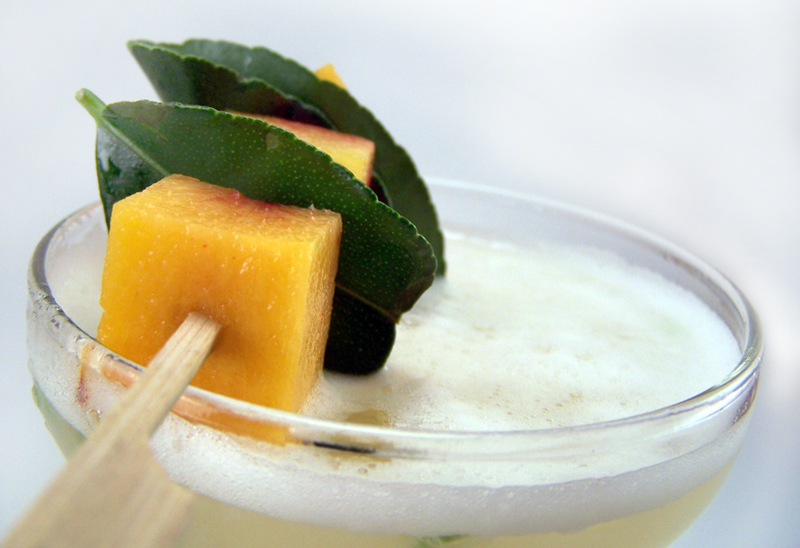 We wanted to create a drink that was reminiscent of mango sticky rice, which is why we selected nigori sake. Nigori sake fills a similar role to a fortified wine in this drink, except it is, unfortunately, even lower proof that soju. Nigori sake is unfiltered sake, so it has a cloudy look and texture, and a sweet flavor. The taste of mango was light in our infusion, so I used only .5 oz of Nigori sake to keep it in balance. Perhaps if I had shaken this a mere ten times, it would have come out OK, but I gave it my standard thirty (this was the drink that made me realize you have to shake low-proof cocktails half as long). Even though it had a good flavor, we wanted to make it more intense, so we switched from mango soju to mango syrup. Adding insult to injury, the lime zest in this garnish made a very discordant smell to the flavor of the drink. It was all wrong. Dry shake, and then shake over ice and strain into a coupe glass. 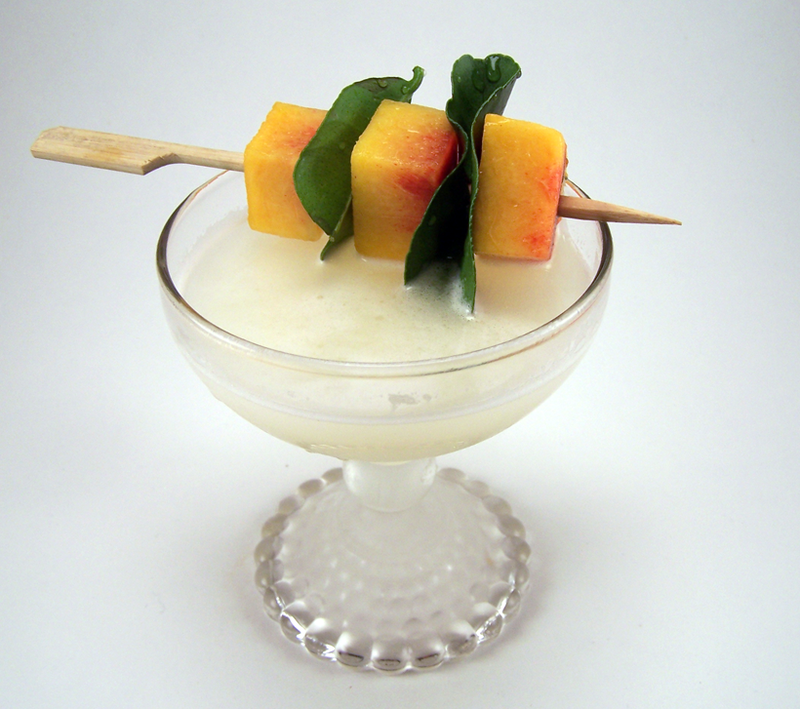 Garnish with skewered mango cubes and kaffir lime leaves. Mango syrup has a very concentrated flavor, so our next idea was to use the Nigori sake as a base spirit, and get the mango in that way. This felt like it was going to be a slam dunk, but it was actually the worst of the bunch. The Nigori sake is so low-proof that even the bird’s eye chili could not save the drink from tasting weak. Worse, the mango syrup’s flavor was so powerful that it was the only thing we could taste over the egg white. So for round three, we decided to concentrate the flavor of the Nigori sake, by simmering it on the stovetop and reducing its volume by two thirds. Even concentrated, the nigori sake had a very mild flavor, but it was strong enough that it did come through in the drink. Of all the variations we made, this one was the best. We used uninfused soju as the base (we were out of mango), but it scarcely mattered against the mango flavor of the mango syrup. It’s possible that the mango soju would have rounded out the mango flavor, but it’s more likely that you would not have been able to notice the difference. We cut the egg white in this one back down to .5 oz, and it didn’t foam as much, but it still added body, and the flavors all came through. It was decent, but not so good that I would serve it to a guest or in a restaurant. Dry shake, and then shake over ice and strain into a coupe glass. 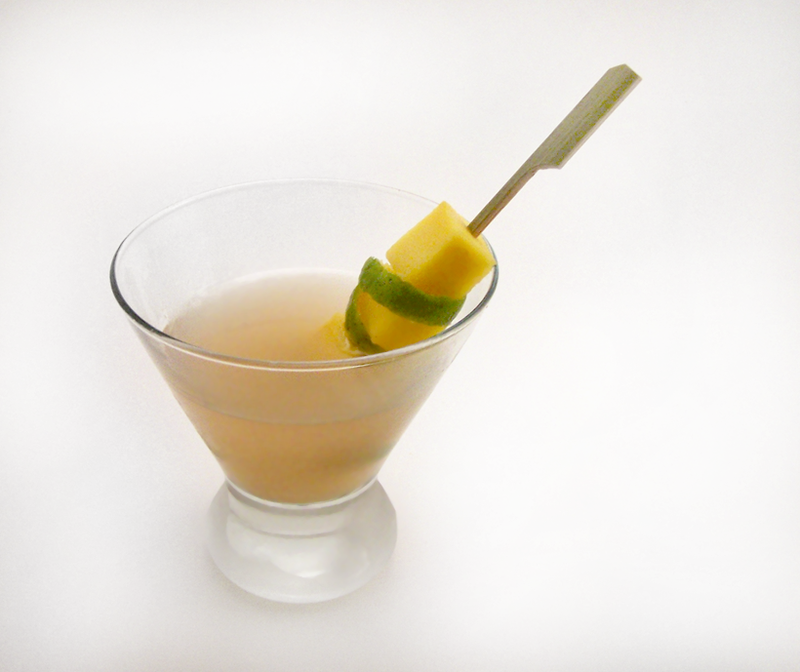 Garnish with skewered mango wedges a kaffir lime moustache. This tasted like a slightly less good version of round #3. Instead of Nigori sake, we blended thai red rice with Bird’s eye chili and Kaffir lime leaves, simmered the mixture in water for a while, and then strained it through a cheesecloth. This procedure was similar to the one we used to make the Horchata for the Oaxacan Flower, and we loved the idea of “Thaichata”. Even though cinnamon is present in Thai food, we did not want to use it because we were afraid it would make the drink taste like more Mexican than Thai. We may try Thaichata again, but the recipe needs some work. As it was, it did a pretty good job of putting the rice flavor into the drink, and it turned it a beautiful pink color, but by this time we were fatigued of the concept, and sick of soju drinks. Only later, we realized that mango sticky rice is made with coconut milk, but it was enough of a juggling act trying to get the flavors of rice and mango to balance against each other. Introducing coconut (i.e., more complexity) probably would not have magically fixed this mess. Gosh, I can’t wait to drink real drinks again! Categories: infusions, original creations | Tags: alcohol, bartending, bird's eye chili, bitters, booze, chili, cocktail, cocktails, drinking, drinks, egg white, horchata, infusion, lemon, lemon juice, mango, mango syrup, mangos, mixology, nigori, nigori sake, orange bitters, sake, simple syrup, soju, thai, thai food | Permalink. 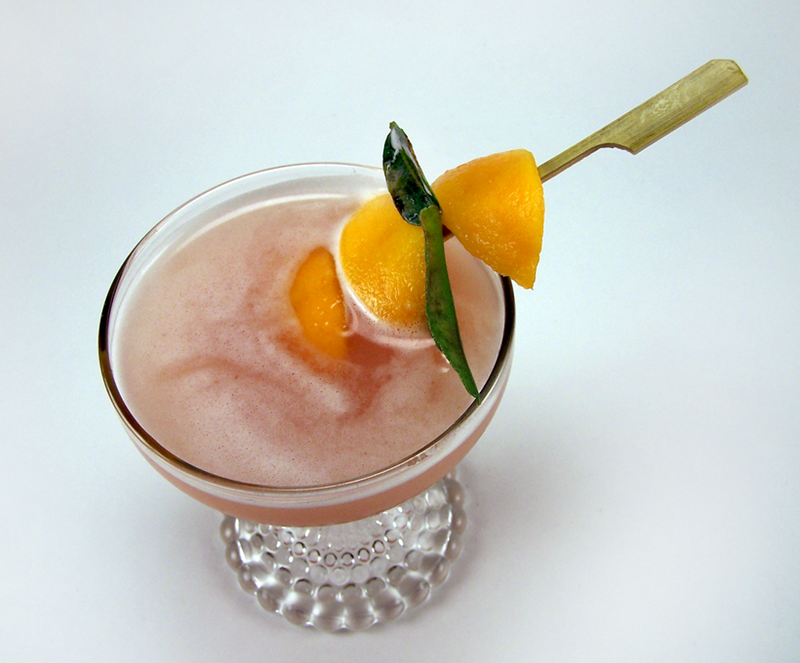 Working from about 500 recipes, both classic and recent, I was able to home in on 53 of the best low-alcohol drinks for my new book, The Art of the Shim: Low-Alcohol Cocktails to Keep You Level. There are only a couple sake based drinks—Kenta Goto of Pegu Club’s Far East Side and Shaher Misif of Cantina’s Epiphany—but they (and the other drinks in the book) might give you some ideas. One of the key revelations for me was learning how much impact a quarter or half ounce of a high-proof spirit can have on a drink. Kenta Goto talks about this with the role of the tequila in the Far East Side, where it provides backbone without dominating the flavor.